Feminists in Jamaica have called it variously “stupid” and “torturous” that women are mandated to wear clothes with sleeves to enter government offices and institutions. Here in TT similar rules exist. 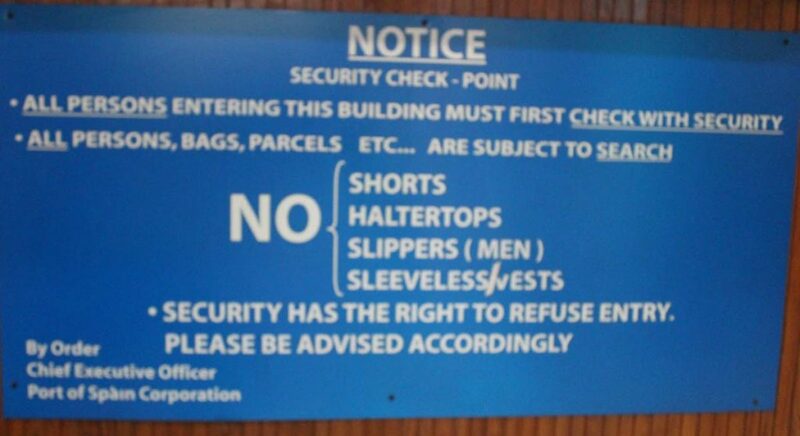 Signs at the Ministry of National Security Immigration Division offices and elsewhere bans visitors from wearing sleeveless clothing –as well as short dresses, short pants and slippers. The website ttparliament.org names “armhole T-shirts,” “slippers,” “short pants” and “track pants” among other offensive wear. Newsday asked a number of people what they thought of such rules. Feelings on the topic are mixed. Some say there’s a time and a place for everything and visitors should stick to the dress code. Others say it violates people’s rights—and is downright backward as well as inconvenient. Giselle Laronde-West, former Miss World and a protocol expert, said in response to an e-mailed question on December 19, “I am not aware of a written rule in TT. It used to be an accepted norm years ago that a woman should not be sleeveless in the workplace [as] part of workplace etiquette – I guess thinking of hygiene. However, times have changed. Not everyone shares that view. “It’s really awful,” said sexual and reproductive health activist Nicole Hendrickson, who has been barred from more than one building because of the dress code. In a phone interview on December 19 she recalled being stopped at the door of the Point Fortin passport office for wearing a short, strappy dress even though it didn’t seem to fit any of the prohibited criteria on the sign outside the office. The Jamaican feminist furore over such rules stemmed from a November 2017 incident in which MP Lisa Hanna was reprimanded by the Speaker of the House for wearing a cap-sleeved dress in apparent contradiction of the Standing Orders. Both men and women are affected in TT. In response to a Facebook post on the topic, photographer Stephen Broadbridge said, “I was not allowed into a government office in Tobago because I was in a T-shirt.” Many other men on the same thread complained of being turned away from the port and from the Licensing Office for wearing shorts or slippers. More than one woman said she had been offered a shawl, jacket or windbreaker so she would be allowed into government offices when wearing sleeveless clothes. Media personality Errol Fabian observed on the Facebook thread, “Hard luck for man,” as nobody gives them cover-ups for their sleeveless tops. Former head of the Public Service Reginald Dumas, in a telephone interview on December 20, said such rules had never existed when he was in the civil service more than 25 years ago. Dumas added, “I don’t know where it came from and how it spread so fast throughout the Caribbean. 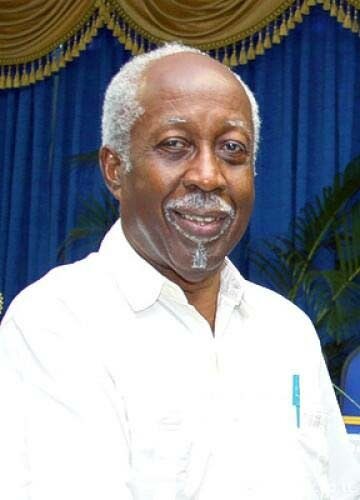 Former head of the Public Service Reginald Dumas. Another former civil servant, who now works in the financial sector, said in a private social media message, “The challenge with easing dress restrictions – as we’ve experienced here at my employer – is that there will always be somebody who will push leeway to the limit and then Peter pays for Paul when the loosening is pulled back. Jokes aside, some feel the issue seriously impinges on human rights. Dr Gabrielle Hosein, head of the Institute for Gender and Development Studies at UWI, St Augustine, wrote in her e-mail response to the question, “Preventing women from accessing state agencies and services because of sleeveless dresses or tops continues a long history of colonial policing of women’s bodies in ways that assume black and brown women’s lack of respectability and the need for them to be clothed in respectable ways in order to access citizenship. “It’s an old position that colonial rules of dress humanise those who don’t have a right to inclusion, making them into proper subjects deserving of recognition and rights. This kind of rule is classist, but also inappropriate for the Caribbean today. Springer indicated the dress codes could be more than classist and sexist. Reply to "UP IN ARMS: TT weighs in on ‘sleeveless’ controversy"